The UK Treasury and the Isle of Man have struck an agreement which aims to clamp down on tax evaders and may net hundreds of millions of pounds. The new campaign is targeting people who try to hide their money offshore in order to escape a tax bill. This will lead to an automatic exchange of information on people who have bank accounts on the island, and a chance for people to come forward to pay tax. Accountants said the move showed the UK tax authority's increased pragmatism. Under the scheme, longstanding investors and account holders will be able to own up to tax they owe, and pay a discounted penalty. This disclosure opportunity will be open from April to 2016. There could be serious consequences for tax evaders who fail to use the facility and are tracked down as a result of the information exchange. They will face higher penalties and the possibility of a criminal investigation. 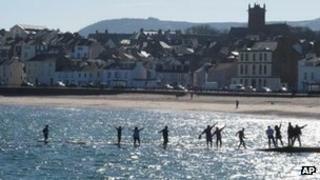 The spur for the agreement with the Isle of Man has come from the United States, which has struck deals with offshore tax havens to track US residents using foreign accounts. UK Chancellor George Osborne said the agreement was part of the government's "commitment to combat tax evasion". The UK has already received £342m from Switzerland, accounting for the first instalment of £5bn which is expected to come in over the next six years. Fiona Fernie, tax investigations partner at accountancy firm BDO, said that this was likely to be repeated with a number of other agreements. "Five years ago such agreements would have been unheard of, yet we are beginning to see more and more being announced. For other so-called 'tax havens', the question being asked is 'where next? '," she said. "While prosecution remains a key deterrent for HMRC, the significant backlog of cases has been well documented, so it is crucial for them to take a cost effective approach and, wherever possible, encourage voluntary disclosure, via bilateral tax agreements, focused disclosure schemes and increased information gathering."